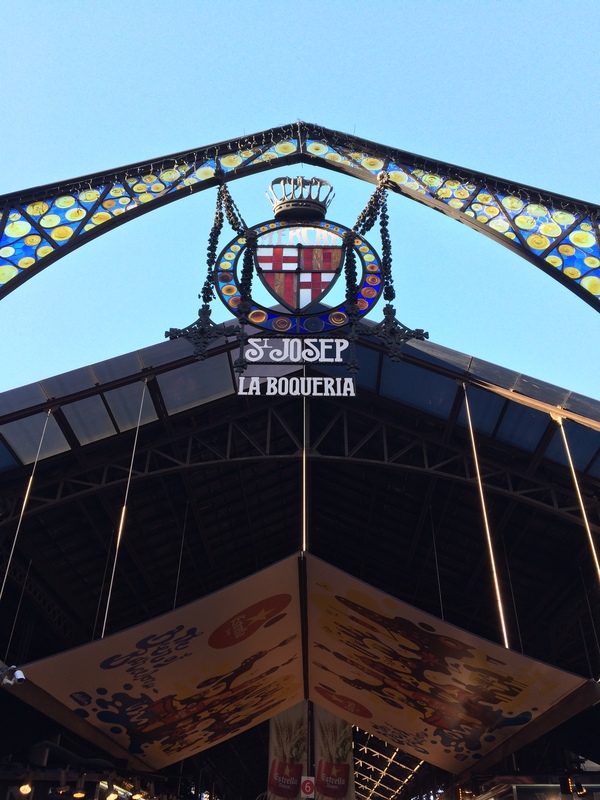 One of the big tourist attractions in Barcelona is the Bouqeria Market. Within the market is where all the fun and the action is. 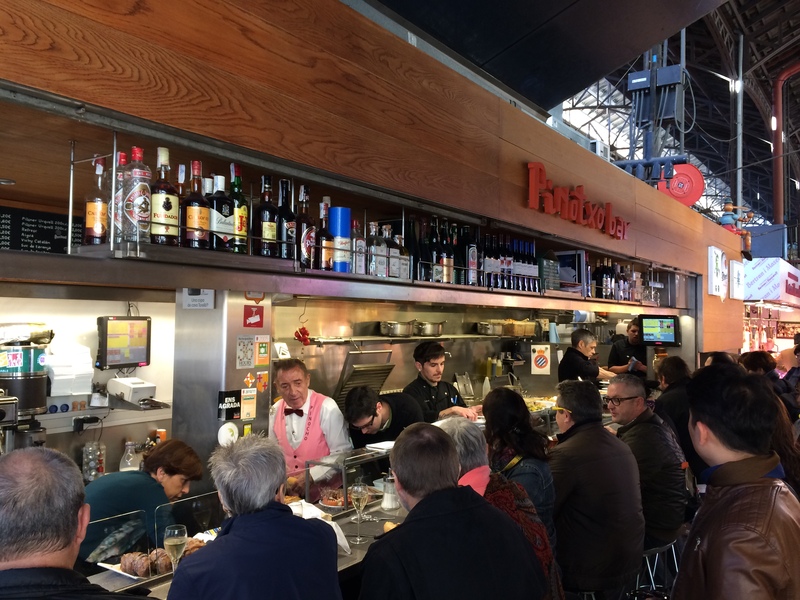 And some say one of the best spots to grab some tapas and other items at almost all hours of the day. 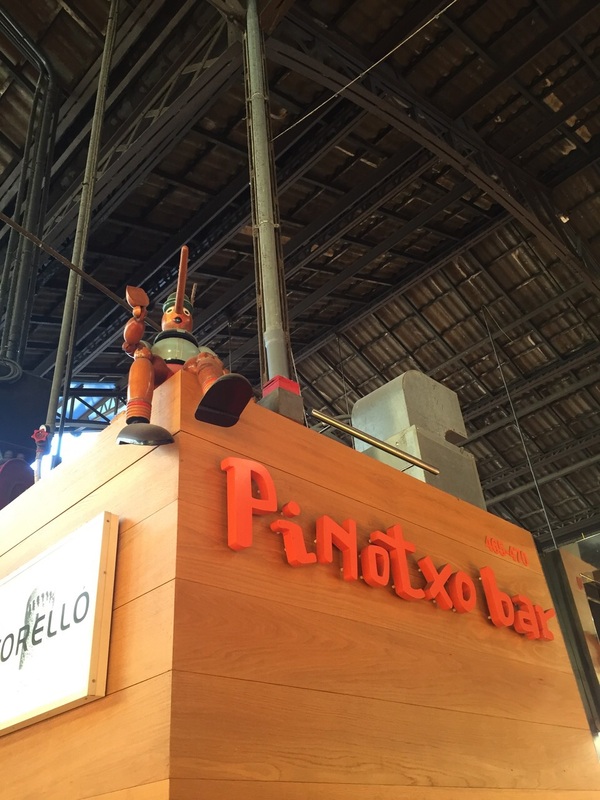 This place is Pinotxo. 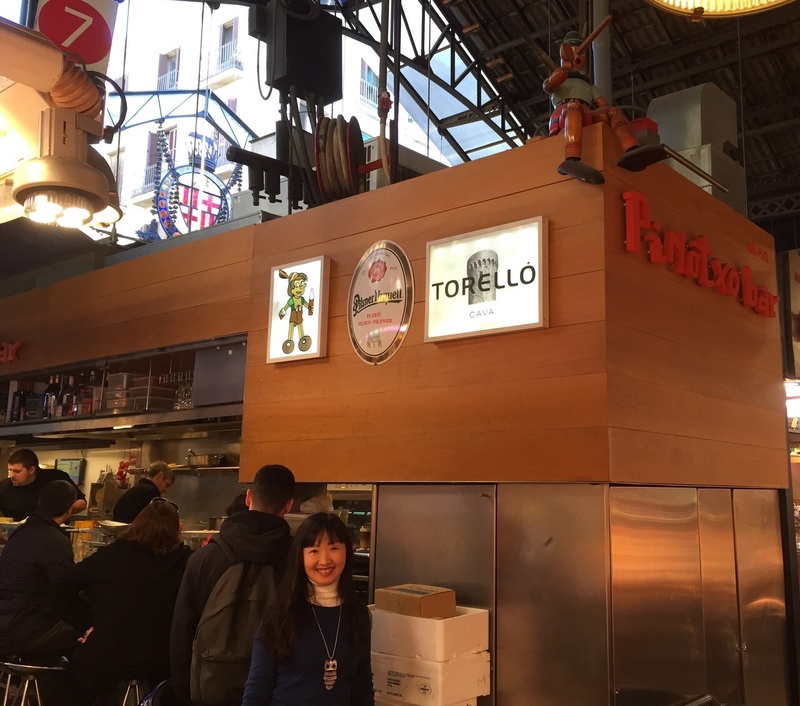 Located inside the market, it has Pinocchio sitting on top of the stall and is an interesting place to start your day. 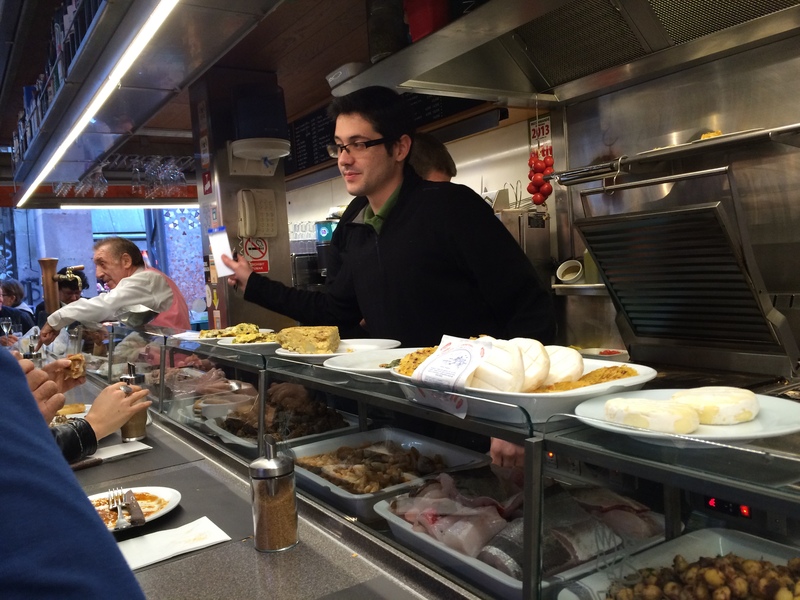 We went and got breakfast there, to soak in a Barcelona breakfast and the atmosphere. The place is not very big, just a row of bar stools and you really have to wait at the strategic position to get a seat. There are stand-up cocktail tables across the aisle, but you want the atmosphere of sitting at the bar. So wait for the seats! Be strategic and see who is finishing and who isn’t and stand right behind them. And once you get your seat, enjoy the show! And try to get a seat by Pinotxo himself. 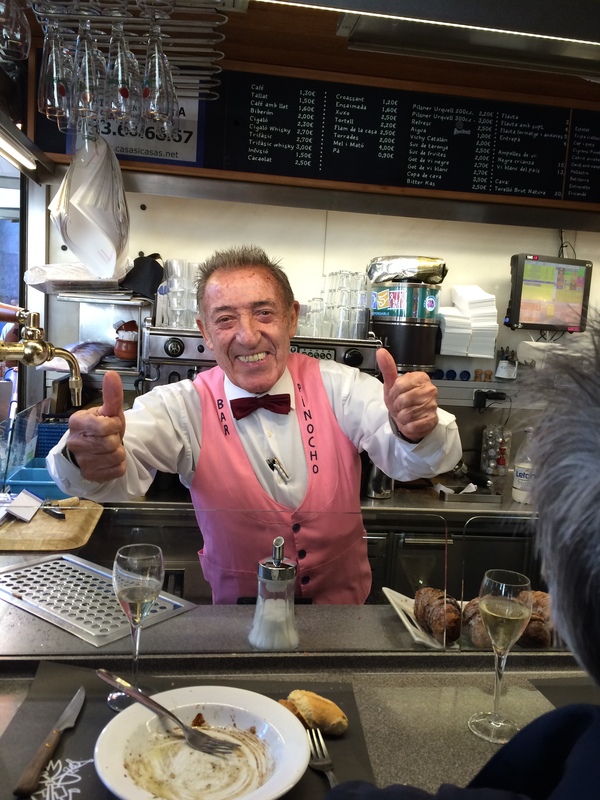 For breakfast he runs the espresso machines at one end of the stall. You see him below in the pink vest. Unfortunately we didn’t get to seat in front of Pinotxo, but still, we were there. And the choices are dizzying for breakfast. 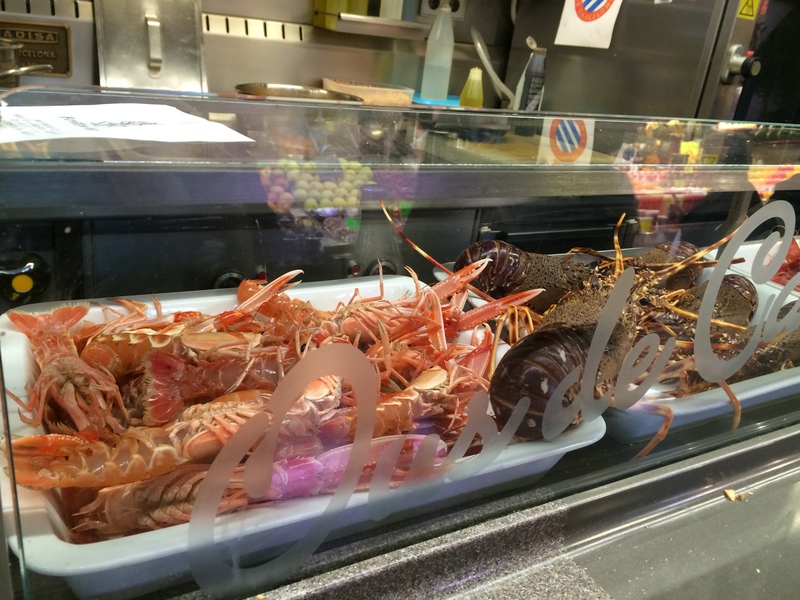 Pastries, seafood, everything in site. The server is very helpful and will talk with you about what you want. Here are some of the fresh items from the market that are available. We wanted breakfast, so we decided to try some of the breakfast items there. 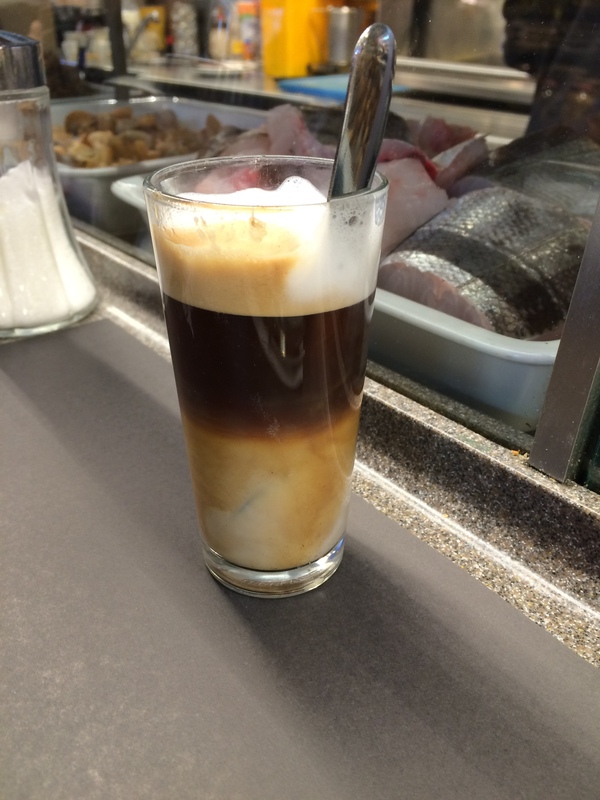 Here we have a Cappucino, interestingly done in a glass with the nice layers. Cafe Con Leche. Nice a strong with a great taste of milk. I can drink it all day. Now for the food. Here is the famous Xiuxo. 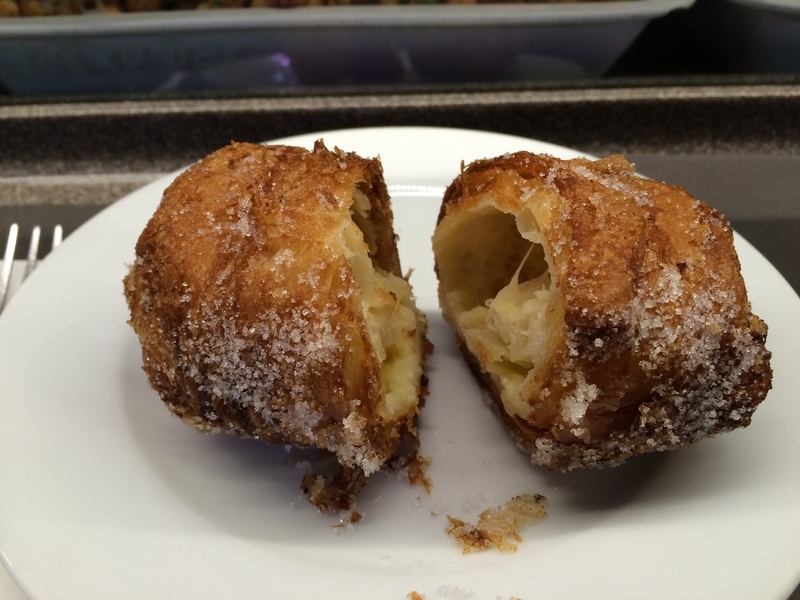 Pastry with custard inside. Wow, this was insanely awesome. It goes so great with the Coffee. I can eat these all day too. 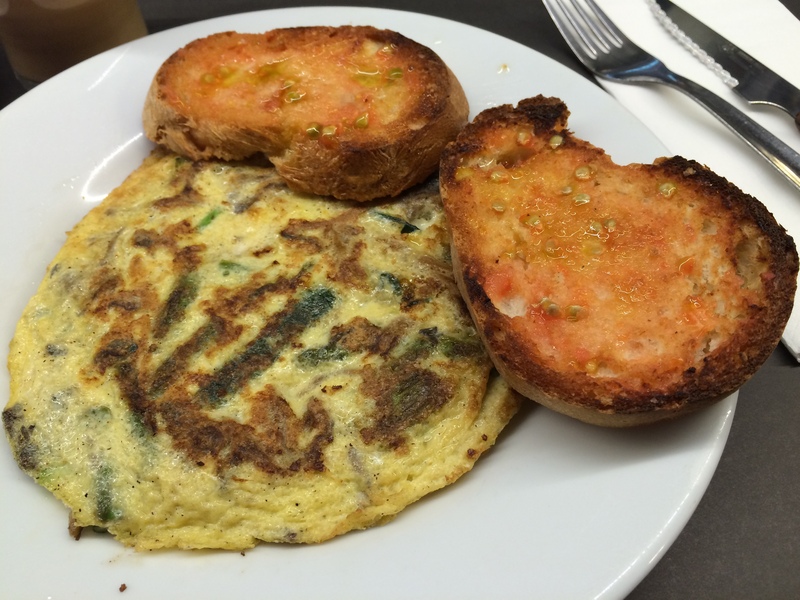 A Vegetable Tortilla with the ever present Tomato Bread, which is a Catalan breakfast staple. So good. 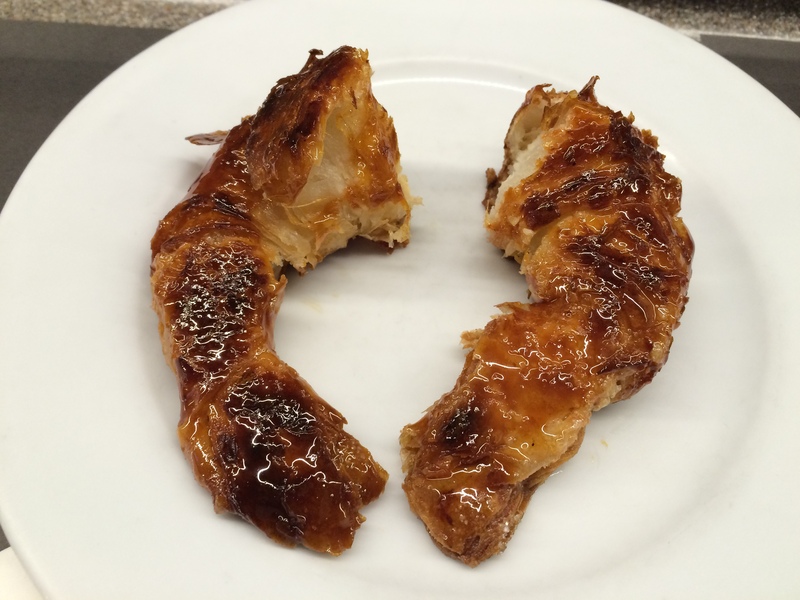 Not to be outdone, the server recommended a Caramelized Croissant. Oh wow, so good. 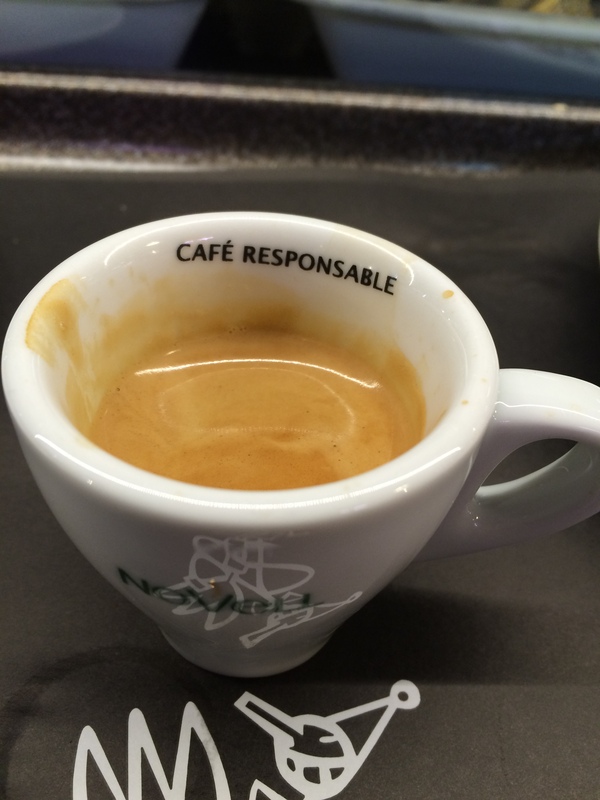 And because I needed more coffee, a nice espresso to end the meal. I would love to try what the savory items are on another visit. I will definitely make it a mission to head here when I am in Barcelona again. And I love this guy! So bright and cheery and a delight to talk with. 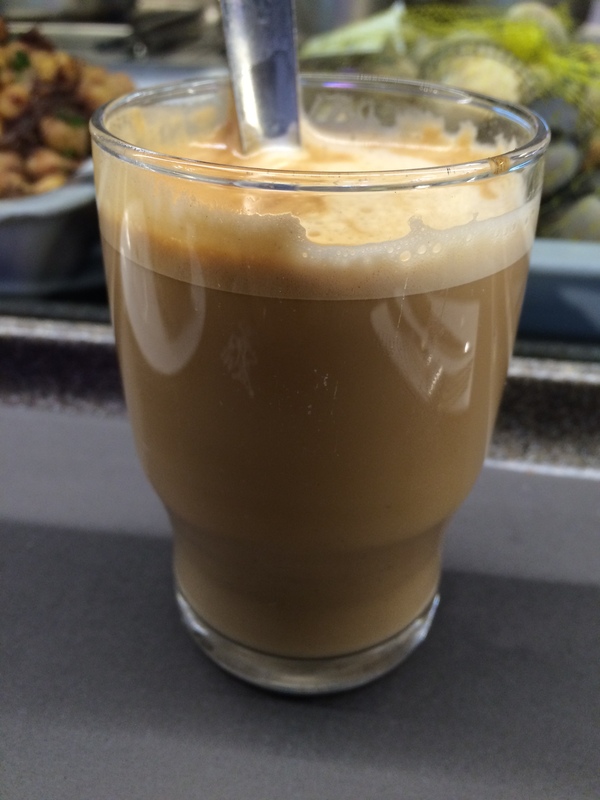 Posted in Barcelona, BreakfastTagged Barcelona, Breakfast, SpainBookmark the permalink.